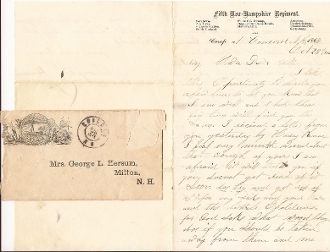 Autograph Letter Signed, 2 1/2 pages, 8vo., Camp at Concord, N.H., Oct. 23rd, 1863. George Hersum (wounded 9/17/62 Antietam, MD, Co "A" 5th New Hampshire Infantry) writes on Unit and Battles imprinted lettersheet including Gettysburg, pertaining to family matters, assured of commission, etc. "...I am sure of a Commission...and have been up to the city to be measured for my uniform..."
Very Fine. Comes with the original patriotic envelope/cover. Stamp removed.